At April’s apartment, the Turtles are putting the finishing touches on their Halloween costumes: Mike is dressed as a clown, Leo is dressed like an Alien, Raph is dressed like a punk rockstar and Don is dressed like an old lady. They give April a call and she (dressed like a jungle girl) tells them to come over to the Halloween party at around nine o’clock. Outside, a gang of thugs case the Second Time Around shop to see if it’s an easy break-in. One thug knocks on the door, looking for “Chet”, and finds only an old lady (Don) home. The thugs decide to take the place and break in through the downstairs. The Turtles hear them coming a mile away, however, and quickly defend the joint. A short brawl ensues and the thugs go down for the count. Unfortunately, however, the fight completely ruined their Halloween costumes. At the party, April wonders if her friends will buy her story that it’s her four “southern cousins” that are dropping by. Suddenly, the door opens and in step all four Teenage Mutant Ninja Turtles… sans costumes. That isn’t a problem, however, as everyone at the party just assumes they’re in costumes anyway and compliment them on their look. *CHET ALERT: The thug scoping out April’s apartment asks “Is Chet here?” The name “Chet” was an in-joke used in numerous Mirage TMNT comics because the guys at the office… just liked the name! *Among the costumed party-goers are Spider-Man, Wonder Woman, Superman, Darth Vader, Batgirl, the Thing, Megaton Man, Etrigan the Demon, Mr. Spock, Thor, Zorro and Popeye. Hard to muster up any vitriol or dull praise for this story, as its neither good nor bad, but simply there. Very Zen, come to think of it. But “Don’t Judge a Book”? 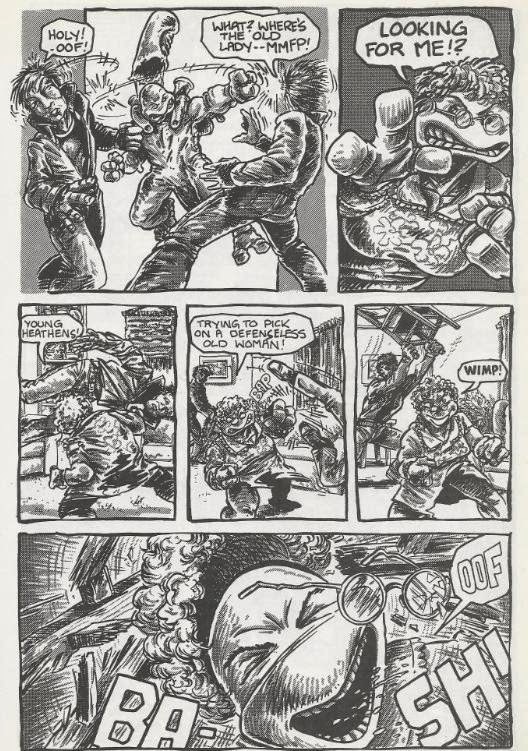 I mean, to those of you out there who spent the 80s playing tabletop RPGs, did you ever feel compelled to create a storyline where your characters dressed like old ladies and beat up burglars? Jeez, just go play Dungeons or Dragons or something. 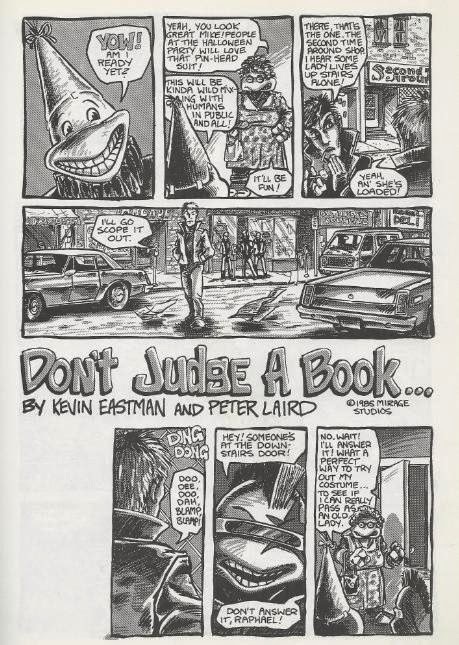 Anyhow, “Don’t Judge a Book” is entirely forgettable save maybe for all the copyright infringement going on at the Halloween party. That’s sort of amusing, I guess, especially if you read the costumed partygoers in the voices of their costume identities. I mean, when else are you going to get to see Popeye interact with the Ninja Turtles? "Mike is dressed as a clown, Leo is dressed like an Alien, Raph is dressed like a punk rockstar and Don is dressed like an old lady." Agreed. Being that Don was the group's "techie", he would have been more into sci-fi - hence, the Alien costume. As for Leo, since he was the leader, he could be something of a "little old lady" at times about the behavior of the others. 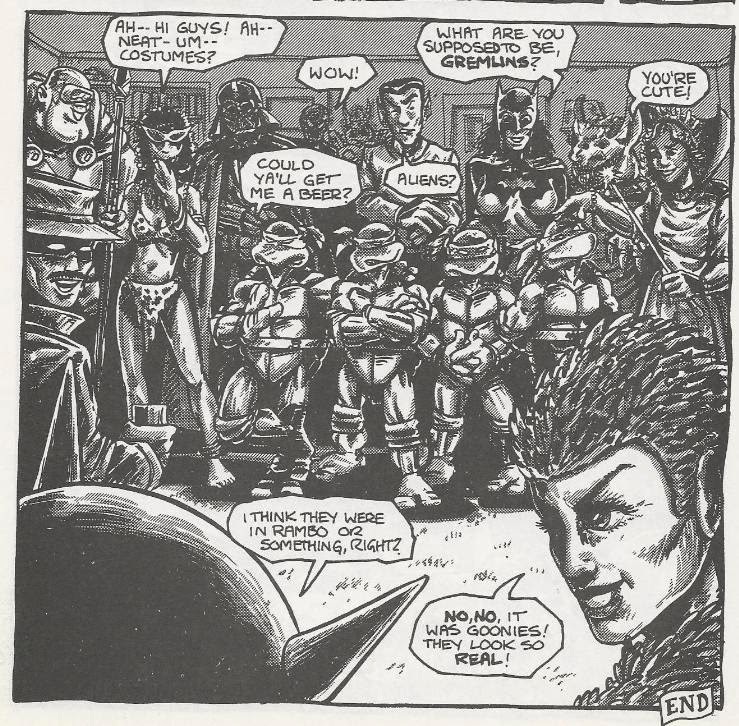 That was one reason that I will always remember this particular TMNT story: how the boys' costumes captured their basic personalities so well. One of the partygoers seems to be dressed as Phantom Jungle Girl from Megaton Man.